Need a special meal to make for your Hunny this Valentines? If you are planning a romantic dinner in, we have just dish for you! What is more romantic than Italian? 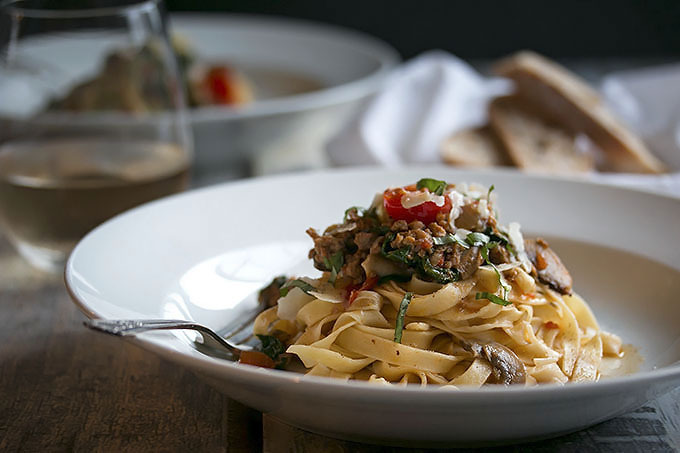 This fettuccine recipe with sausage, spinach, and wine is elegant and very easy. 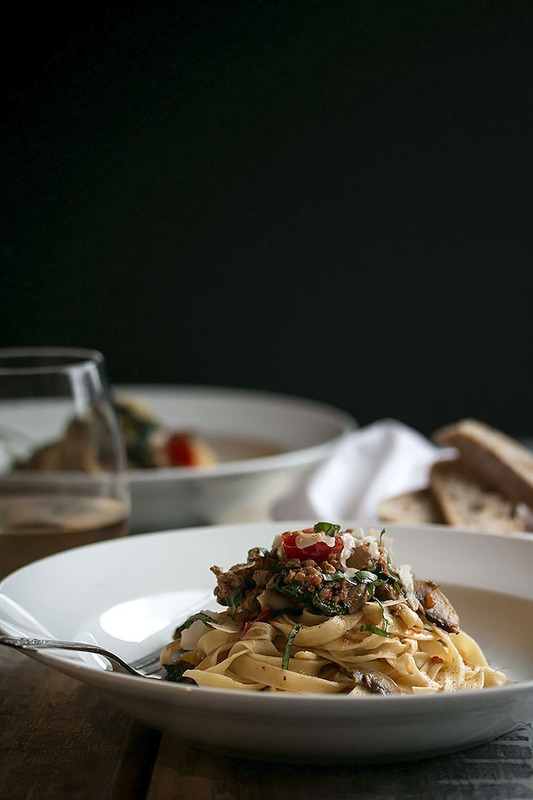 Your sweetheart will be seriously impressed even if they are used to you creating amazing meals. This was one of those meals that was just kind of thrown together. Kevin and I were at our friends place in Kelowna and we were trying to figure out what to make for dinner. Carole and I made this pasta by just throwing things together that we had and seemed like they would work and it turned out amazing! Everyone loved it and it has become a dish that both Debbie and I make often. 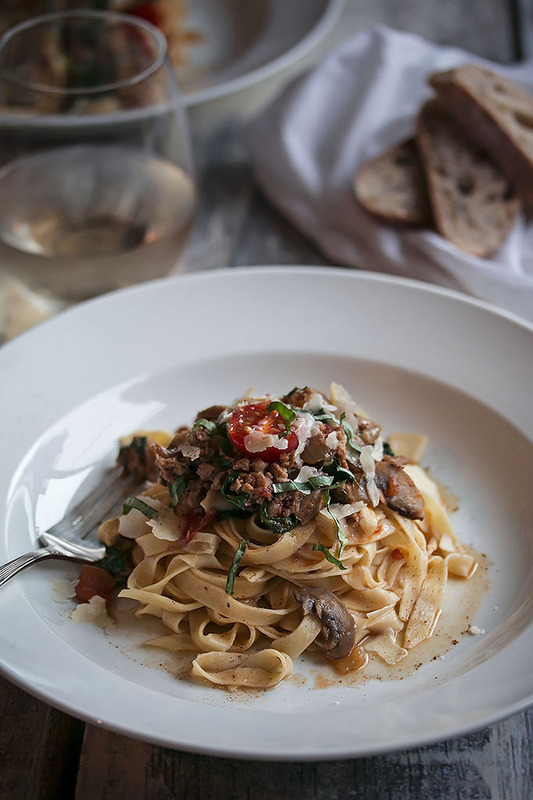 This fettuccine recipe is very simple and quick, flavorful but not saucy with a distinct wine flavor that’s just right and not overpowering. There’s a little kick from the spicy sausage and it’s become my favorite way to eat spinach. I like to use a spicy Italian pork sausage for this dish, but I have also used turkey sausage and Debbie used farmer sausage once. I usually look for sausage that’s local, always made with natural ingredients and with a lot of herbs and spices in it. Use one that has some kick to it. Debbie and I made our own pasta for this and if you want to give that a go, our recipe for homemade pasta is here. 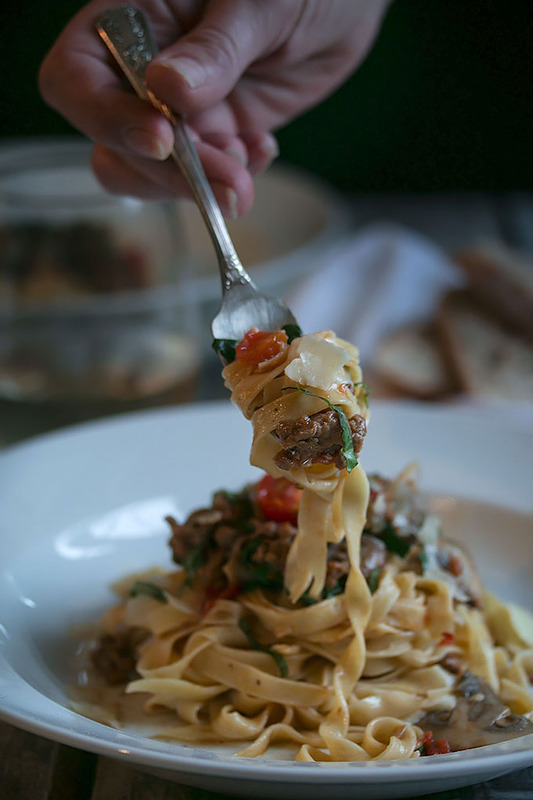 You can’t beat the taste of tender fresh pasta. 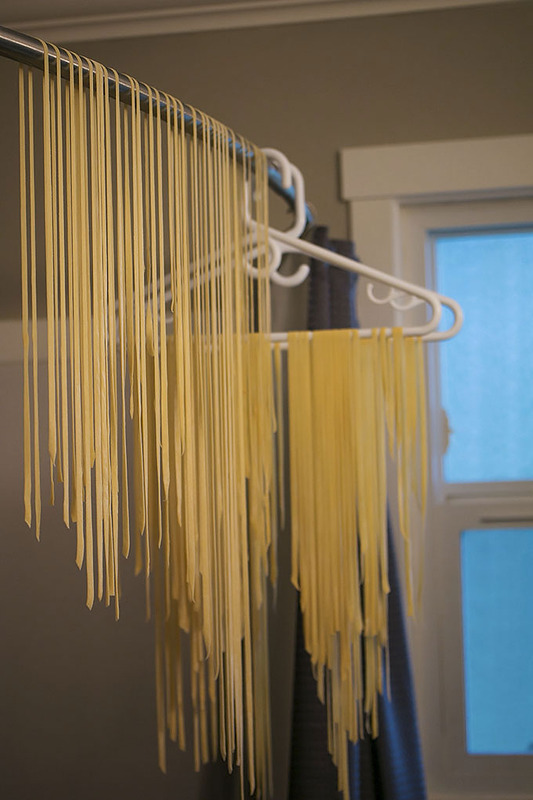 To make your own, here is our recipe for homemade pasta. If you don’t have the time or don’t feel like it, store-bought works just as good, especially the fresh ones that aren’t quite dried yet. Those taste the best if you’re going the store-bought route, but I also make this recipe with gluten free noodles. 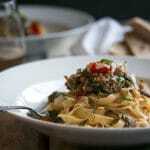 Whatever your preference is will work just fine for this fettuccine recipe. We had a bit of fun making our pasta this time! We couldn’t figure out where to hang it so it would dry out a little and we could wrap up what we weren’t going to use right away. We ended up hanging it over the shower curtain rod and it worked perfectly! I’m sure this is what they do in Italy… Yes? Heat a large skillet on medium heat. Add the oil. Cut open the sausage casings and put the meat into the skillet. Break up the sausage while it cooks. You don't want big pieces. Cook til nicely browned. Meanwhile, fill a big pot with water and put it on the stove, throw a couple pinches of salt in and bring it to a boil. Add the onion, mushrooms and garlic. Saute for a while until the onions are translucent and the mushrooms are cooked. It's the best if the onions can get a little bit browned as well. You may have to turn up the heat a little bit to get them to brown. Add the tomatoes and keep cooking until the tomatoes start to break down into a sauce. Add the wine and turn the heat down a little to medium-low. At this point you want to add the pasta to the boiling water. Then add the chopped fresh spinach to the sausage mixture and stir. Let the spinach wilt right down. Add the sliced cherry tomatoes and half the parmesan cheese. Give it a stir. When the pasta is ready, drain it well and add it to the sauce mixture. Toss it well and serve it right away. Serve with a sprinkle of chopped basil and parmesan cheese. You were so adventurous making your own pasta! They must dry it out over their shower rods too – lol. This really sounds like it would make a lovely meal because, as you said, you can’t go wrong with Italian. Any kind of white wine you like!